Sen. Elizabeth Warren (D., Mass.) was invited at least three times to speak with Native American students at Harvard Law School while she was a faculty member, but she never accepted, according to a former president of a Native American student group. Dr. Gavin Clarkson, a citizen of the Choctaw Nation who received both a doctorate and a law degree from Harvard while Warren was a professor, says he "personally invited" her three times to visit with Harvard's Native American Law Student Association (NALSA), which he headed while attaining his dual degree. Warren, who had identified as a minority in law professor directories and was touted by Harvard as a Native American hire, never accepted his invites. "I was on campus at Harvard for five years, from 1998 to 2003," Clarkson said. "Warren was identified in the AALS law teacher directory as an American Indian faculty member." "Hi, we're the Native American students on campus and it would be nice to meet the only Native American professor on the faculty," was the message Clarkson was attempting to get across, but he says he was dismissed by Warren every time. "I personally invited Elizabeth Warren, face to face, three separate times," Clarkson said. "I did it at least once per year for three straight years," he said. "She basically dismissed me all three times." Warren's office did not respond to requests for comment on her interaction with NALSA while at Harvard. The current leadership of Harvard's NALSA chapter says it has never invited Warren to speak, despite her thin ties to the Native American community. 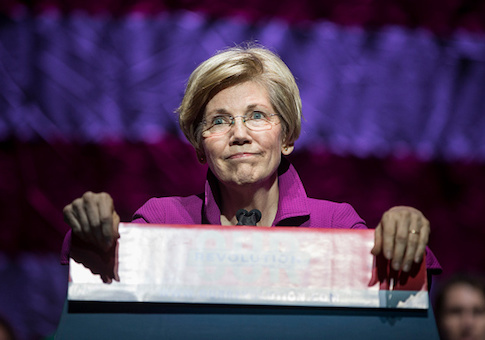 "As far as I know, NALSA has never extended an invite to Elizabeth Warren despite her attenuated ties to the Native American community," said co-president Chris Childers, a member of the Echota Cherokee Tribe. "We have no plans to do so under the current leadership." Clarkson's goal when he led the student group was to improve Harvard's outreach to the American Indian community, which he viewed as something Warren should have taken the lead on given her claimed heritage. "We were constantly concerned about the fact that Harvard was doing a terrible job relative to peer institutions at recruiting American Indian students, despite the fact that Harvard was founded in its original charter to educate American Indians," Clarkson said. "Part of it was they weren't putting in the effort to go out and recruit American Indian students, but usually if you have an American Indian on the faculty, that faculty member takes the lead on going out to Indian country and recruiting students," he said. "I don't know that Warren in the five years I was at Harvard ever stepped foot on a reservation." Clarkson says he made clear to Warren during his interactions with her that the reason he was extending his invite to her was because her "reputation on campus was as the only Native American member of the faculty." On the other hand, he notes, other professors on the faculty who "cared about Indian students" would "meet with us all the time." Clarkson says he knows of at least two other times Warren was invited to meet with NALSA by members on the other side of the political spectrum who were also dismissed. Clarkson was appointed by the Trump administration to join the Interior Department’s Bureau of Indian Affairs but resigned to run for Congress in New Mexico. The Washington Post reported that the resignation came in November and was due to an investigation by the agency into an Obama era loan program he was involved with, but Clarkson says the report was "entirely false." He says the investigation had nothing to do with his resignation, which didn't come until December 29 and was due solely to his political run, he says. An outspoken critic of Warren's treatment of the Native-American community, Clarkson says the senator is not "a supporter of tribal sovereignty." He points to the failure by the Consumer Financial Protection Bureau, an agency championed by Warren, to recognize tribal sovereignty as one of his major disappointments. He said he encourages the attention President Donald Trump has directed toward Warren's false claims of Native-American ancestry, but would prefer he use the term "Fauxcahontas" rather than "Pocahontas." Clarkson was at the National Congress of American Indians last week when Warren made a surprise appearance to defend her controversial claim of Native-American ancestry. He did not attend her speech. Warren has been criticized for doubling down on the ancestry claims rather than acknowledging their dubious nature. UPDATE 10:50 a.m.: This article has been updated to include additional comment on the terms of Clarkson's resignation from the Department of Interior. This entry was posted in Politics and tagged Elizabeth Warren, Harvard. Bookmark the permalink.